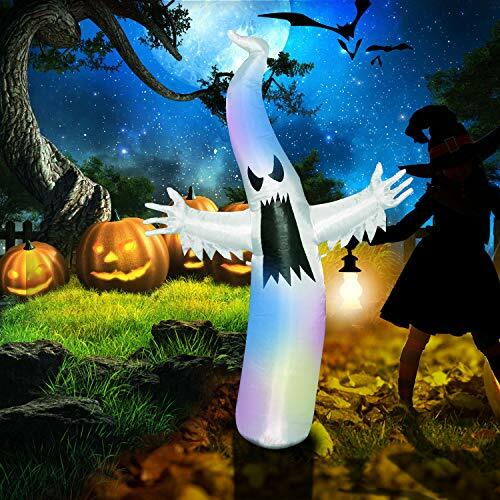 This Pop-Tech 6Ft inflatable ghost is exclusively designed for Halloween decoration. This led Halloween decorations not only has scary face and pose design, also has 8 built-in high-brightness color-changing LED lights which make the ghost more spookier and horror, with these will make your neighbors or friends, kids happy to scream when see this scary inflatable ghost in your yard, which make your Halloween party and outdoor decor more funny and more happy. - The inflatable ghost is a giant 6 feet tall inflatable decoration, but it can inflates itself in only seconds with Built-in air blower instead of needing you spend dozens of minutes or even hours to manually fill, just connect the adapter provided with UL certification and need you plug it into a standard electrical outlet. - When the Halloween party is over, and you want to use it next year again, just deflate it and pack down to a small size for storage. You will be able to enjoy your Halloween party with using this inflatable ghost year after year. Pop-Tech products are sold with a full 30-Day Money-Back guarantee. If you are dissatisfied with your purchase for any reason, you can click ''seller contact'' button in your amazon account to contact us for a replacement or refund. 6 FT TALL HALLOWEEN INFLATABLE GHOST DECORATION. Add this giant inflatable ghost to your yard to add a real spooky nightmare ambiance for your Halloween party.Just plug in this scary inflatable ghost, it can quickly self-inflate with built-in electric Motor and Blower. Best halloween decorations for kids and adult. If you have any questions about this product by Pop-Tech, contact us by completing and submitting the form below. If you are looking for a specif part number, please include it with your message. Gemmy 37213X 2.3 ft. Star Wars Yoda with Candy Cane44; 20.87 x 27.56 x 42.13 in.